Chhatrapati A*, Nadkarni T**, Mishra I*, Jassawalla MJ.***. Most of the ovarian hyperstimulation (OHSS) cases occur due to ovulation induction followed by HCG trigger. But OHSS may rarely occur in cases of multifetal gestation, hypothyroidism or polycystic ovarian syndrome. We report a case of OHSS in a spontaneous pregnancy in a primigravida with twin pregnancy with severe hypothyroidism. The clinical presentation included severe abdominal discomfort. After ultrasound examination the diagnosis was confirmed. Patient was managed conservatively. Ovulation induction therapy sometimes leads to ovarian hyperstimulation syndrome which occurs in the luteal phase especially after HCG trigger for ovulation. The syndrome was first described in 1941. In very rare spontaneous pregnancies OHSS can occur due to follicle stimulating hormone receptor gene mutations. The likelihood is more if it is associated with maternal hypothyroidism or multifetal pregnancy. The symptoms vary; nausea, vomiting and abdominal discomfort in mild OHSS and ascites, hydrothorax, thromboembolism and renal failure in severe form. Treatment is mainly supportive. A 21 year old primigravida married since 1 year 6 months was referred to our hospital with 2 and a half months amenorrhea and severe abdominal discomfort. Urine pregnancy test was done which was positive. Patient was stable clinically. Ultrasound (USG) was done. 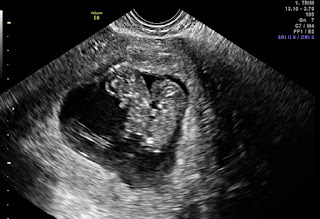 Her USG detected, a monochorionic monoamniotic twin pregnancy with multiple ovarian cysts bilaterally and mild free fluid in the pelvis. Right ovary measured 9.4x7.2 cm with multiple cysts, largest being 3x3 cm. Left ovary measured 11x8 cm with multiple cysts, largest measuring 5x5 cm. Patient did not give history of receiving any ovulation induction agents. Patient was admitted for evaluation and further management. On physical examination, patients’ vital parameters were stable. Abdomen was soft non tender. On per vaginal examination uterine size was 12 weeks. Bilateral ovaries were cystic. Laboratory investigations revealed severe anemia ( Hb 6.4 gm% ), hematocrit ( 20.1% ), normal blood electrolytes, blood urea nitrogen ( 10 mg/ dL ), creatinine ( 0.8 mg/ dL ) and coagulation profile ( PT/INR 1.0 ). SGOT/SGPT was slightly raised ( 43/35 units/l ). Serum proteins were normal ( Total 6.9 g/ dL; A/G 4.2/2.7 g/ dL). Serum β HCG was above 300,000 mIU/ ml which was corresponding to the weeks of gestation. Serum TSH was very high (> 100 uIU/ ml) suggestive of severe hypothyroidism. Serum estradiol (E2) was 4720 pg/ ml and serum progesterone was 353.41 ng/ ml which was high. Patient was managed conservatively. Hemoglobin electrophoresis was normal. Correction was done with 2 units of packed red cell transfusion. Post transfusion Hb was 9.3 gm% and PCV was 31.7%. For hypothyroidism 100 ug of levo thyroxine was started after consultation with the endocrinologist. At 11 weeks nuchal translucency/ nasal bone (NT/ NB) scan was performed which was normal. There was no change in the size of the ovarian cysts. As patient was symptomatically better she was discharged after 15 days observational period. She followed up in OPD regularly; but she aborted spontaneously; complete abortion at 17 weeks of gestation. USG pelvis done after 10 months of abortion was completely normal. Patient was advised to try for natural conception with early ANC registration. Ovarian hyperstimulation syndrome very rarely occurs in a spontaneous pregnancy. Iatrogenic OHSS occurs following HCG trigger for ovulation, hence is seen at about 3-5 weeks of amenorrhea. But spontaneous occurs between 8-14 weeks. Recently the Follicle Stimulating Hormone (FSH) receptor gene mutations are identified which leads to increased sensitivity to circulating HCG in spontaneous OHSS. De Leener has proposed a classification of spontaneous OHSS syndrome into three types according to clinical presentation and FSH receptor mutation. Type I : Due to mutation in FSH receptor gene. The recurrence rate of spontaneous OHSS is very high in this type. Type II : Due to high circulating HCG which is seen in multifetal pregnancies or in molar pregnancies, this is most common type. Type III : Associated with maternal hypothyroidism. In pregnancies where ovulation induction is done by FSH, the follicular recruitment and enlargement is found during exogenous FSH administration and can lead to iatrogenic OHSS. In spontaneous pregnancies, the follicular recruitment and growth occur later due to abnormal stimulation of the mutated FSH receptor that is abnormally sensitive to normal levels of circulating HCG, produced by syncytiotrophoblast of pregnancy. Hence the spontaneous cases of OHSS generally develops at 8 weeks amenorrhea and resolves spontaneously at the end of the first trimester of pregnancy. In literature many cases were described as spontaneous pregnancy with OHSS and maternal hypothyroidism. In these cases it is assumed that high levels of thyroid stimulating hormone stimulate ovaries directly due to structural resemblance to FSH and can cause ovarian hyperstimulation. [4,5] In our case hypothyroidism was present. The pathophysiology of spontaneous OHSS associated with hypothyroidism is not well understood. The various theories are (a) in hypothyroid patients, there are high levels of circulating estriol produced through 16 hydroxylation (less potent estriol) as against 2 hydroxylation pathways (more potent estriol) seen in normal patients. This causes decreased negative feedback regulation and excessive release of gonadotropins by ovary. (b) High levels of thyroid stimulating hormone can directly stimulate ovaries in women with hypothyroidism and can cause ovarian hyperstimulation. OHSS can be classified according to the degree of severity of affection as mild, moderate severe and critical. Royal College of Obstetricians and Gynecologists in 2006 [7,8] classifies OHSS as mild OHSS, in which patients have symptoms of abdominal bloating and mild abdominal pain; moderate OHSS, when nausea, vomiting, moderate abdominal pain, is present with ultrasound evidence of ascites. and severe OHSS, identifiable by clinical ascites, renal affection oliguria, hemoconcentration, PCV 45%, and hypoproteinemia; and critical OHSS, with tense ascites, oliguria or anuria, hematocrit > 55%, and leukocytosis (WBC > 25,000). The management of OHSS depends on the degree of severity. Early recognition and prompt appropriate treatment will avoid serious consequences. Medical treatment, undertaken in first line, may be insufficient. Therapy is supportive, syndrome being self-limiting. Mild cases can be managed on OPD basis with daily measurement of weight and monitoring urinary output. Serial measurement of hematocrit, electrolyte and creatinine are done. Severe OHSS requires hospital admission and prompt management to replace lost intravascular volume and prevent its potentially fatal complications namely renal failure and thromboembolic events. Sometimes drainage of fluid or debulking of ovarian cysts may be needed. OHSS is very rare but potentially serious complication. The exact etiology is not known conclusively but further research is going on. Certain factors like high levels of HCG hormone found in early pregnancy in cases of multifetal gestation and molar pregnancy and mutations in the follicle stimulating hormone (FSH) receptor gene, which leads to an increased sensitivity to HCG, may be some of the possible etiologies. Twin pregnancies and hypothyroid patients are more prone to OHSS. If we diagnose and manage spontaneous OHSS at the appropriate time we can prevent any severe complication. Dr. Umesh Athawale, Athawale Diagnostic center for the ultrasound examinations. 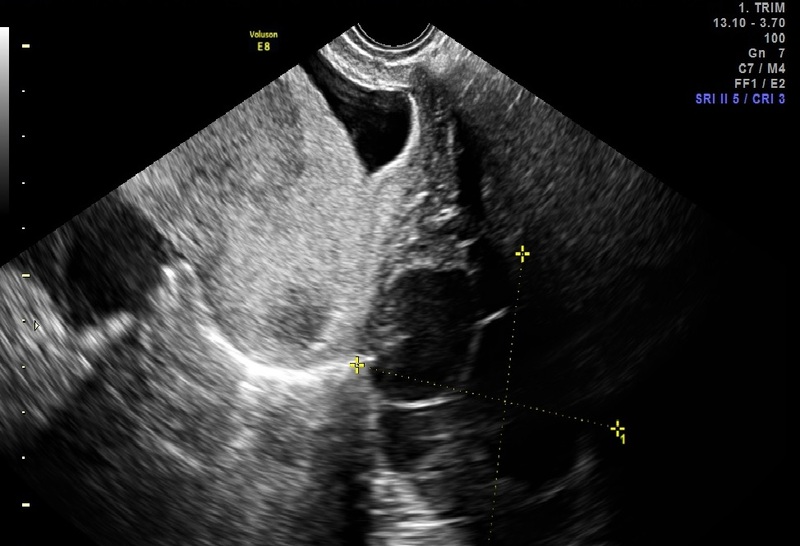 Delbaere A, Smits G, Olatunbosun O, Pierson R, Vassart G, Costagliola S. New insights into the pathophysiology of ovarian hyperstimulation syndrome- What makes the difference between spontaneous and iatrogenic syndrome? Hum Reprod. 2004 Mar;19(3):486–9. De Leener A, Montanelli L, Van Durme J, Chae H, Smits G, Vassart G, et al. Presence and absence of follicle-stimulating hormone receptor mutations provide some insights into spontaneous ovarian hyperstimulation syndrome physiopathology. J Clin Endocrinol Metab. 2006;91(2):555–62. Ozer Oztekin, Ferit Soylu, Orkan Tatli. Spontaneous ovarian hyperstimulation syndrome in a normal singleton pregnancy. Taiwan J Obstet Gynecol. 2006 Sep;45(3):272–5. Ayhan A, Tincer ZS, Aksu AT. Ovarian hyperstimulation syndrome associated with spontaneous pregnancy. Human Reproduction. 1996;11(8):1600–1601. Rothmensch S. Spontaneous ovarian hyperstimulation syndrome associated with hypothyroidism. Am J Obstet Gynecol. 1989;160:1220–1222. Taher BM, Ghariabeh RA, Jarrah NS, Hadidy AM, Radaideh AM, Ajlouni KM. Spontaneous ovarian hyperstimulation syndrome caused by hypothyroidism in an adult. Eur J Obstet Gynecol Reprod Biol. 2004;112:107–9. Jenkins JM, Drakeley AJ, Mathur RS. The Management of Ovarian Hyperstimulation Syndrome. Green-top Guideline. 2006 Sep;(5):1–11. Davis M, Kennedy R. Ovarian hyperstimulation syndrome: Aetiology, prevention and management. Reviews in Gynaecological and Perinatal Practice. 2006;6:26–32. 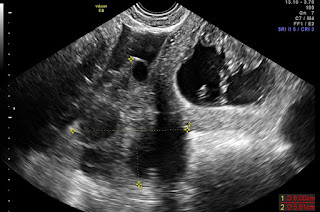 Aboulghar MA, Mansour RT, Serour GI, Amin Y. Ultrasonically guided vaginal aspiration of ascites in the treatment of severe ovarian hyperstimulation syndrome. Fertil Steril. 1990 May;53(5):933–5.